Gadsden C.P. has committed to being a place where God touches young lives! Whatever your child's age he or she will find smiling faces, loving teaching, and godly play while at church. In fact most parents at Gadsden C.P. have a hard time getting the fun to stop! Your kids will know what it is to be loved after a morning with our wonderful Sunday School teachers. We have well planned Bible based classed for every age group beginning at 9:30AM every Sunday. We've just completed our children's worship room, a little sanctuary just the right size for little songs, little Bibles & little prayers. During "Big" Worship children attend with their parents or guardians through the first twenty minutes of worship. 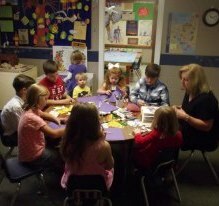 Children are then escorted by our "helpers" to their own time for worship, a fun craft and a lesson. All ages gather for our family meal in the fellowship hall before moving to a time of bible lessons and games. After group playground time is every kids favorite! 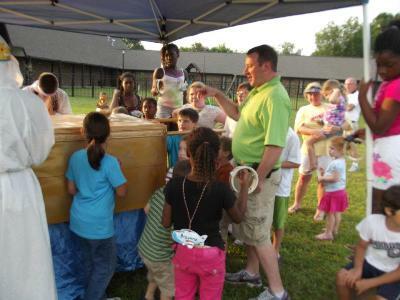 Every year we love to host special events centered around the children from both the church and the community. Whether it is our annual Easter Egg Hunt and Picnic, Trunk or Treat Fall Festival, Vacation Bible School, Christmas Caroling, or other special days, your chidlren won't want to miss these wonderful fun-filled events. Call the church office for more details.